Fashion Maven... Mommy: Ulta Beauty Event Tomorrow Featuring It Cosmetics!!! 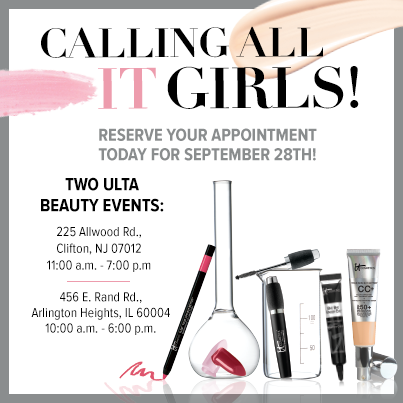 Ulta Beauty Event Tomorrow Featuring It Cosmetics!!! I will be attending this event and will be live tweeting, facebooking and instagramming. I will also be sure to document the entire event so that all my non-local It girls can experience all the fun... virtually! Aww, I'm sure that will be super fun! That sounds like a great event being at!